With the new year here, it is the time of year we make resolutions and organize many areas of our lives. I will be starting a closet organizing series later in January, but, in the meantime, I wanted to give you an “organizing pep talk” to help you make resolutions to clear clutter now. That way you can live a more organized life in 2016. As a personal organizer, I sometimes feel like a therapist. People form attachments to objects and items, but what they really want to hold onto is the memory. You have to work on deciding if you have this item because you love it, because you love the memory associated with it, or because of the way you felt when you purchased it or received it. You will always have that memory (our brains are magnificent that way), so you don’t need the object. Personally, I have a very easy time separating sentimental attachments and only surround myself with items I truly love. I do understand, though, after working with all my organizing clients, that most people have a hard time with this. There are many reasons why you should remove the clutter from your life in 2016. Clutter can be a physical and mental barrier. It blocks you from time efficiency and interferes with your life goals, or those new resolutions. Before you set new resolutions, make a promise to remove clutter that keeps you from accomplishing your other goals. Clutter causes you to misplace or neglect items and creates a state of “never being on top of things”. This lowers your energy (spinning those wheels, right?) and it takes up space and prevents something new and better from coming into your life. Clearing this clutter is a growth opportunity. Clearing this will make you feel calmer, clearer, less stressed and happier in 2016. Paper clutter. Give away or recycle what you don’t need… old mail, magazines, newspapers, etc. Paper may not seem to take up much physical space, but believe me this is a major barrier. Books. I am not an avid reader, but if you told me to give away my design books I would cry. If you love your collection of books, then by all means keep them. However, if you do not have enough space for all of them, now might be the time to slim down your collection. Sell or gift to a friend the books that you will never use anymore or don’t really want. Acknowledge the experience and joy of reading them and let them go to a new home for someone else to enjoy. Past endeavors. Decide what represents you NOW and give away the rest. This includes hobby materials, art supplies, collections, unfinished projects, etc. Honor who you are now, and don’t be bound by feeling like it was a waste of money or past failure. If you truly want to learn how to do it, then decide to make time for it in 2016 and follow through! Unwanted gifts. Honor the relationship you have with the person by regifting or donating these items to someone who will truly appreciate them. If you will never use them or can’t find the right “home” for them in your home, then allow someone else to use them. Duplicate items. Give them away to someone who needs them. We never need more than one of an item. Don’t live your life holding onto a backup “just in case”. You can always repurchase if something does happen to the item, in the meantime, the space it takes up is more valuable then the cost to replace “if” it happens to break. Things that need to be fixed. Either make a resolution to finally finish your “fix-it list”, drop them off for repair this week, or clear them out of your space. Childhood items. Keep what is important to you, I truly mean that. It is okay to keep any of these items if you truly love them, but really think about these items. You must determine if you are holding on to them because you love them or because of the memory you associate with them. You will ALWAYS have the memory, you don’t need the item to remember what you loved about that moment. “I don’t know what to do with all of it.” There are always local charities such as a women’s shelter or donation center that will pick up the items for you. Find comfort in knowing someone else who truly needs it, will feel the joy you do from the item. You are giving the item a fresh life. “I have no time.” I promise you, if you make time to do this task, you will gain more time after removing the clutter. Make it a project, not a problem. “It’s too overwhelming at this point.” Start with one room. If that’s too much, start with one corner or cabinet. Focus on the process, not the end point. Feel accomplishment when you clear just a single drawer. Pat yourself on the back for every baby step you do, because it’s really a big step in the right direction. Stop it before it starts. Throw things away when they are no longer useful or not being used. Have a “home” for every item. (A “junk drawer” can be a legitimate home–I give you permission for one junk drawer for those odds and ends that you need, but seem to only belong there.) Otherwise, find a spot for every item. If it does not fit in your space, don’t bring it in or, remove something old to make room for the new. Become a conscious consumer and consider things before buying them. Consider the impact it will have in your life and home. Do you really need it? Start to see order and cleanliness as support for yourself. It might take a moment longer to put it way, but you are honoring your space, your life, and ultimately yourself by doing this. Avoid perfectionism. Worrying about what others think or creating an “over-sterile” environment becomes oppressive. It is fine to allow a room to look “lived-in”. However, do this by choice, not irresponsibility or unconsciousness. If you can’t keep up, hire help. Gift yourself with a monthly cleaning lady or bring in an organizer for those big projects. I think the biggest piece of advice I can leave you with is to retrain your thinking about organizing. Enjoy the process and take clutter clearing as a growth opportunity that you are choosing to do, rather than a dull job you have to do. We so often will research, read self help books, and go to extreme measures to grow as a person. Cleaning the clutter will help you grow too!!!! Look at it that way and you will have an entirely new perspective on your de-cluttering project. 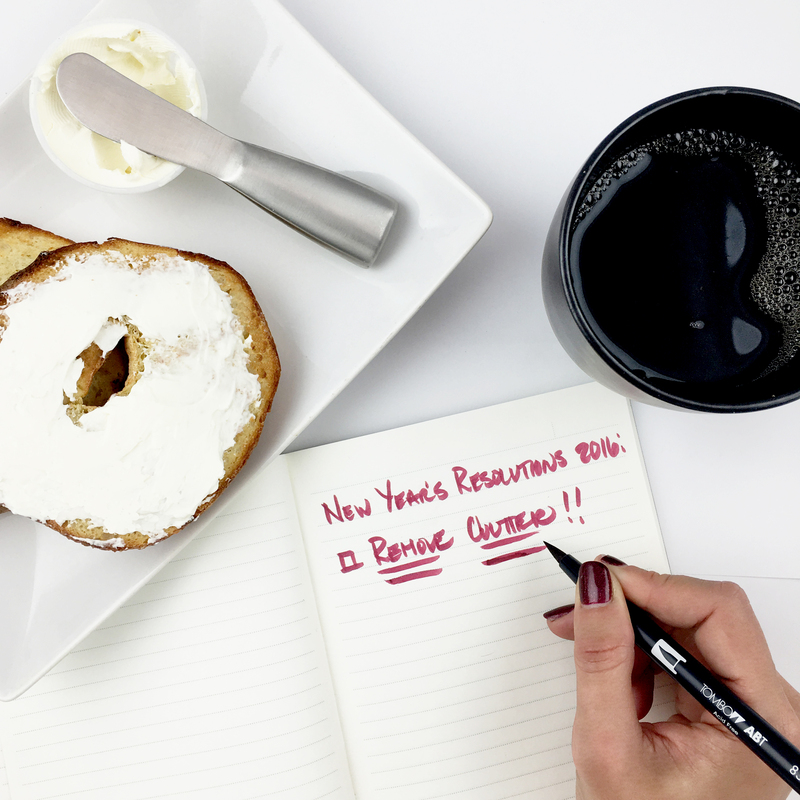 I hope you have some exciting resolutions for 2016… ring in the new year right by clearing the clutter first! Do you have any tips or tricks you use to knock out your clutter in your home? I would love to hear it. Leave a comment about your mountain of clutter and how you tackled it! Also, be sure to check back in January for my “Anatomy of a Closet” series, where I will break down all the pieces of your closet and help you reorganize and fall in love with your clothing closet!